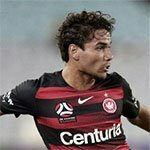 Description: A young fullback who spent several years in the Wanderers youth system before being called up to the A-League team for season 2018/19. Starting RB next season when Risdon fks off. Hell, starting RB for the rest of this season. He's played better than Risdon has.